4. Once well combined pour the filling into the cupcake liners (reserving some for the blue swirl). Please note that the filling will be very watery and will remain watery until after it "sets" in the fridge. Comment below your favorite way to eat coconut! Heard about Unicorn Pasta? Try this fun and easy recipe to color your noodles with a rainbow of unicorn combinations! Our colors are plant-based, non-GMO and artificial dye-free for a naturally beautiful and nourishing bowl of fun! 1. Cook and rinse pasta. Strain and let cool. 2. Put ½ packet pink color into a medium sized bowl. Put other ½ of pink and 1 blue packet (for purple) into another medium sized bowl. Or, another option is to add colors to ziplock baggies to toss with noodles. 3. Put 1 part pasta in with pink color and other half with pink and blue color combination. Stir with mixing spoon in bowls, or gently toss in ziplock baggies. Add a little water if needed to dissolve and blend color. Once noodles are saturated with color, strain again to remove excess water if needed. 4. Toss with coconut nectar and lemon juice to taste. 5. Plate pasta and be creative! Add colorful fruits, vegetables, and more to enjoy a gorgeous bowl of healthy fun! Run out of time or ideas? This recipe couldn’t be any simpler as a quick and easy, last minute dessert! 1. Blend dry instant pudding with 1 color packet of your choice, or mix and match. 2. Pour in 2 cups milk or non-dairy milk-substitute and stir. 3. Continue stirring in a medium bowl, or beat with hand mixer low speed until well-blended, about 2 minutes. 4. Chill for an hour. 5. Pour in 4 medium bowls. 6. Dash rainbow sprinkles on top. 1. In three bowls, add packets of oatmeal. 2. Add color packets on top of oatmeal. 3. Pour hot water over oats and color and stir to combine. 4. Finish with your favorite toppings like sliced bananas, dried fruit or nuts. Blue and Pink packets combined to make purple. 1. Put milk, yogurt, vanilla, flavor, coloring and sweetener in a blender and mix. 2. Pour into glass container or jar and stir in chia seeds. Seal tight. 3. Leave in refrigerator for eight hours or overnight. 4. Pour into glass over ice and top with fruit, nuts, or other topping of choice. Your kids will love making these yogurt banana pops rolled in their favorite colors and topped with coconut or sprinkles. This low sugar and no-bake snack is not only fun to make, but healthy too! Healthy Back to School Snacks-Colorful Lunchbox Sandwich Surprise! In the bowl of your stand mixer fitted with whisk attachment, or with a hand whisk, add the cream cheese, dill, lemon juice and garlic. Whisk on low until combined then speed mixer up to high and whip until light and fluffy. Divide the cream cheese mixture into three bowls, about ¼- ½ cup each (should weigh about 72 g). Add colors into each bowl. Add ¼ tsp. ColorKitchen Pink Dye + ¼ tsp. ColorKitchen Blue Dye for purple (or, ½ packet each color), ¼ tsp. ColorKitchen Blue Dye (or, ½ packet color), for blue and ½ tsp. ColorKitchen Green Dye (or, ½ packet color), for green. Stir to combine completely. Spread cream cheese onto four slices of bread. On the other slices, add a thick layer of cucumbers and sprinkle with black pepper. Sandwich the cream cheese bread slices and cucumber bread slices together and cut the crust off. Wrap and put into your child's lunchbox, for a healthy and fun lunchtime surprise! Or, serve with organic Sea Salt & Vinegar Chips and Watermelon. Note: If you don’t want to make four sandwiches, just store the extra cream cheese mixture in an airtight container in the fridge. You can dip veggies in it! Eating clean and celebrating summer go hand in hand with chia seed pudding. Chia seed pudding is the perfect cold breakfast on a hot day, or as a fuel up snack during summer. There are great health benefits and lots of way to put your own personal twist on this summer treat. 1. Put milk, vanilla, coloring and sweetener in a blender and mix. 4. Dish out pudding into a bowl and top with fruit, chocolate, nuts, or other topping of choice. Make naturally colorful pasta and transform your favorite dish into a colorful delight. Whether it be unicorn noodles or unicorn pasta, macaroni and cheese or pasta salad, you’ll have fun making and eating it too! 1. Cook and rinse pasta. 2. 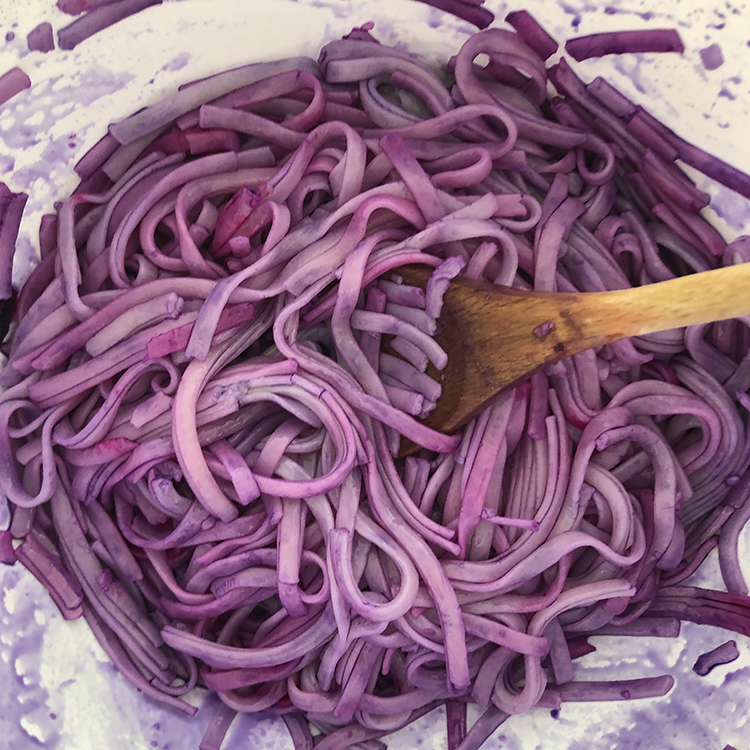 Use 1 ColorKitchen Food Color packet per 2-3 cups cooked pasta (8 cups per bag) for deep colors, or 1 color packet per entire bag of pasta or a light pastel shade. 3. Put color powder in ziplock bag and add strained pasta. Mixed thoroughly, tossing pasta in bag until all the color is dissolved and pasta is completely covered. 4. Let sit for 10 minutes for color to soak in. Rinse each color separately. 5. Add sauce or topping of your choice and enjoy! Between the artificial coloring and sugars in a variety of frozen treats, it's hard to feel good about feeding your kids some of the summer treats they crave most. Try our quick and easy-to-make alternative, Greek yogurt popsicles made with ColorKitchen food coloring, for a protein-packed, real-food choice for the summer months. Using your favorite Greek yogurt, add a tablespoon of honey per cup of yogurt. Next, stir in as much ColorKitchen color powder as desired until thoroughly blended. Lastly, mix in a few chocolate chips. Thoroughly mix all ingredients together. Scoop into popsicle molds and allow to set in the freezer. For multiple colors, scoop in one color layer at a time, then freeze. If you don't have a nifty popsicle-making container like the one in this post, use an ice cube tray with toothpicks for mini popsicles. Pick a color, any color! These rainbow pancakes can add a pop of color to any breakfast table. By adding a dash of ColorKitchen food colors to your favorite pancake batter, beautiful creations are easily produced. Because ColorKitchen plant pigments are sourced from nature, cooking the pancakes on low heat preserves their color vibrancy. Blending ColorKitchen's primary colors will give you a rainbow of hues. Beet red and yellow make a vibrant orange, yellow and blue turn into a mint green, and blue and beet red create a lovely lavender purple. Mix the colors with a couple drops of water to prepare them to be added to the pancake mix. Because these are liquid, making your batter on the thick side will help keep your pancakes light and fluffy. Admittedly, these rainbow-colored pancakes were relatively time intensive...mixing six different batter colors in individual bowls may be above and beyond the call of duty for weekend breakfast time. However, picking your kid's favorite color of pancake could be a special birthday breakfast treat, or an engaging breakfast activity to make cooking fun for the little ones. With the 4th of July just around the corner, fireworks, barbecues, and patriotism abound. Frosting-filled strawberries are a quick treat to whip up and join in on the celebration! By using red strawberries, ColorKitchen Bright Blue to color the frosting, and powdered sugar for dusting, only real-food ingredients will grace your table this holiday weekend. To make this treat, begin by carving out the strawberry top to expose the inner-cavity. Set the strawberries aside and using your favorite frosting, add 1/2 color packet of Bright Blue frosting to each cup of frosting. If you have decorating tools like bags and tips, scoop your frosting into a bag, and using your favorite tip, fill each strawberry to the brim with blue frosting. If you don't have decorating tools, scoop the frosting into a ziplock bag and cut a small piece off the corner plastic and squeeze to fill each strawberry. When finished, lightly dust the strawberries and frosting with powdered sugar.